TEAS English Practice Test: Get Ready for Your TEAS English Exam! The TEAS Practice Test is an exam for English and Language Usage, focused on grammar, word meaning, punctuation, spelling, and syntax. The results of the TEAS exam contribute to the ATI Nursing Education. 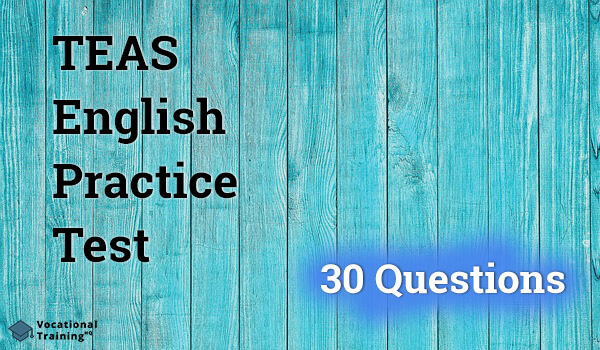 If you’re looking to improve your English skills specifically for the TEAS exam, this is exactly what you need, targeted practice on sample questions from past TEAS English tests. The teacher was, since, tedious excessively, many of his students fell asleep. Since the teacher was excessively tedious, many of his students, fell asleep. Since the teacher was excessively tedious, many of his students fell asleep. Since the teacher was excessively tedious; many of his students fell asleep. The correct sentence contains a dependent and an independent clause, separated by a comma. Please mark the NOUN in this sentence: The nursing assistant was called in to administer the medicine. Nouns are words that name a person, place or things. Please state the information of these sentences in a single sentence: The milkman came to the door. He had two bottles of milk for my grandma. I heard the knock on the door. I took the bottles from the milkman. When I heard the knock on the door, I took the bottles for my grandma from the milkman who had come to her house. Having had bottles for my grandma, the milkman came to her house, where I hear a knock on the door and took the bottles from him. Coming to the house with two bottles for my grandma, the milkman knock on the door, which I heard, and I took the bottles from him. When I heard the knock on the door, I took the bottles from the milkman for my grandma, who had come to the house. A single sentence is most clear when written with a small number of clauses. ___________ insecure whether the examination would prove the medicine's efficiency. "They're" is a contractional form of "They are". Please choose the correct words for this sentence: The ____________ items in the store can be also purchased through an online ___________ sale. The correct spelling is: miscellaneous and garage. Please mark the correct word for this sentence: The scouting group _____ looking forward to new adventures this summer. The correct word is the singular verb "is" that must be used for the collective noun "group". Never let anyone tell you who you are. What type of sentence is this? This is an imperative sentence that usually doesn't contain a subject and gives a command. Please mark the error in this sentence: The application consultants emphasized the importance of the fully-completed application, unrespective of professional experience. The correct word is "irrespective". They could accept anything from them, accept money. They could except anything from them, accept money. They could accept anything from them, except money. They could except anything from them, except for money. The verb "accept" means "to receive". The word "except" is a preposition that means "but". Which of these words indicates the meaning of the word in bold? The van was replete with an immense quantity of cosmetic products. The word "replete" means "well-supplied". The play about the Renaissance painter. The play was about the Renaissance painter that I saw last month was enchanting. The play about the Renaissance painter had never interested me until last year. The play about the Renaissance painter interested me, but it was tedious for my mother. The correct sentence is a simple sentence that contains one subject and a single verb. Please mark the correct word for the following sentence: To______ it may concern. The correct answer is the object pronoun "whom". Names are always capitalized, while noun words which indicate family relations should be in lowercase unless used as a title. Please mark the correct word for the following sentence: The director's speech_______ the entire staff. The correct word "affected" means "impacted on something". Please mark the most adequate words to fill this sentence: _______ almost 8 o'clock, so the mall will open_____ doors in one hour. The correct words are the contraction "it's" and the possessive form "its". Please choose the correct punctuation marks for the following sentence: Follow these directions to get to the mall ____ make a right at the next intersection, drive seven miles to the second stop sign, then turn left, and continue another mile until you see the parking lot on the left-hand side. The correct mark is the colon which introduces many items in one list. Please mark the correct word for the following sentence: The results of their examination had an_____________ low track record of relevance in those professional realms. The correct word if the adverb "abysmally". Please mark the correct word for the following sentence: When students travel to a summer camp, the group leader must accompany _____. The correct word is a plural pronoun that would replace the noun "students". Please mark one of the following phrases that would complete this sentence: Next summer, I _________. The adverb of time "next summer" indicates the future tense that uses the verb "will". Please mark the correct word for the following sentence: The United States has _____ states than the number of countries in Europe. The word "than" indicates a comparative sentence in which the comparative word "more" is necessary. Tina expressed her thrill about scuba diving in the ocean. The correct sentence is a declarative sentence. The ______ late worker was given the pink slip by his employer. The correct answer is "habitually", meaning "repeatedly, often". At the age of 15, my relatives sent me to a summer camp. When I was 15, my relatives sent me to a summer camp. At the age of 15, I sent my relatives to a summer camp. My relatives, at the age of 15, sent me to a summer camp. The correct sentence is B. Please mark the correct word in the following sentence: The girl_____ to swim across the river. The correct word is "wants" a plural verb for the singular subject "girl". It's important ____ buy the school uniform on sale, so you do not spend ____ much money on it later. The correct answer is the article "to" that is placed before an infinitive verb. Please mark the correct word for the following sentence: Any naval commandant must be capable of giving _____ orders. The correct word is "decisive", meaning able to make choices rapidly. They're obligation is to provide lunch packages for everyone that there expecting. Their obligation is to provide not lunch packages for everyone that their expecting. Their obligation is to provide lunch packages for everyone that they're expecting. There obligation is to provide not lunch packages for everyone that they're expecting. In the correct answer the pronoun "Their" and the pronoun and verb "they're" refer to plural, i.e. a group of people. The board, which obeyed the rules, were not letting him to get away with it. Either almonds or walnuts are a rich source of magnesium. One of the choir singers sing louder than the others. A few of the students was running the webiste. "Where will you go?- to a hotel or to a camp?" he asked. "Where will you go?- to a hotel or to a camp," he asked. "Where will you go?- to a hotel or to a camp?," he asked. "Where will you go?- to a hotel or to a camp," he asked? The correct sentence is A. The correctly capitalized sentences is C.